Some time ago I completely rewired my '78 Gibson Les Paul Special Double Cutaway, replacing the old pots, caps, selector switch and jack. I also added a couple of push-pull switch pots for pickup phase reverse and coil serial/parallel circuits (more on these later). Shortly after I originally bought the guitar way back in 1979, I replaced the two single-coil P90 pickups with new DiMarzio humbuckers—a PAF at the neck and X2N at the bridge. I don't have anything against P90s (my early '70s Les Paul Deluxe Gold Top and SG Special guitars had P90s), I just like the sound of humbuckers better. After 30 years, the guitar's controls had become extremely corroded and were long overdue for replacement. 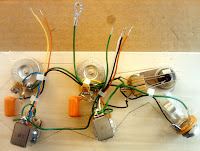 I started by creating a wiring diagram to use as a guide during the project. I chose to use '50s style wiring, "orange drop" tone caps, DiMarzio volume pots and push-pull tone pots, and Switchcraft right-angle selector switch and output jack. The push-pull pots allow you to rewire your pickups on-demand to change the guitar's sound. Pulling up on the neck tone control puts the neck pickup out of phase with the bridge pickup, and gives the guitar a thin "distant" sound. Pulling up on the bridge tone control switches the bridge pickup coils from standard series wiring to parallel wiring, and makes a humbucker sound like a single coil pickup (similar to a coil cut switch but without disabling the noise canceling function of the humbucker). Before going any further I had another problem that needed fixed. Around the time I originally replaced the pickups, I swapped the selector switch location with one of the pots and still had an oversize mounting hole that I needed to deal with before going any further. After finally fixing the oversize mounting hole and getting all the new parts, I made a control wiring jig from a thin plank of wood. I drilled mounting holes in the wood for the pots and selector switch. 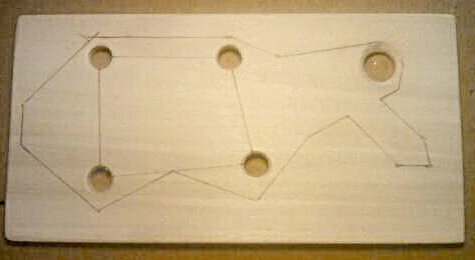 The outline on my wiring jig is the rough dimensions of the control cavity opening. The leg at the lower left represents the hole between the control cavity and the side mounted jack. I mounted the new pots, selector switch and jack on the wiring jig. Since the jack mounts on the side of the guitar, I attached it to the wiring jig with tape. I wired the push-pull switches, control pots, selector switch and jack. I soldered the tone caps between the volume and tone pots and added treble bleed circuits (the small cap and resistor) to each volume pot. Note the green ground wires soldered to the components. The push-pull switches took the longest time to wire and solder. The closely spaced lugs and their tiny little wire holes made it very difficult to work with. After having to replace a couple of wires that I nicked with the soldering iron, I finally switched to heat resistant wire. 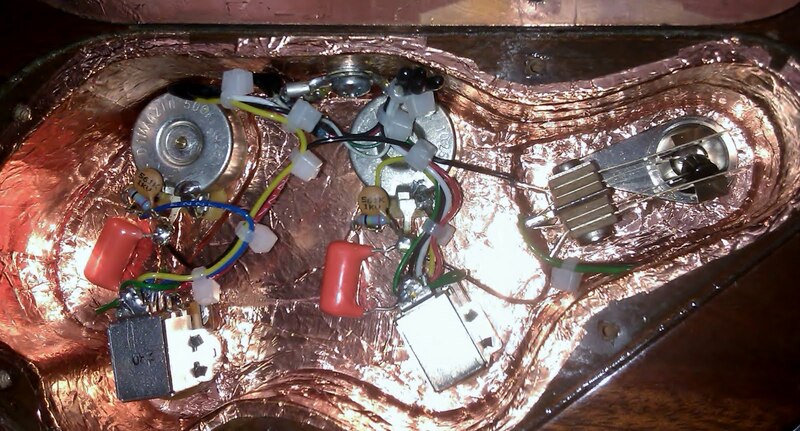 I then removed the old components and wiring (except for the pickups) from the control cavity. I decided to shield the control cavity with self-stick copper tape. I completely lined the bottom and sides of the cavity and the back side of the cover with strips of the copper tape. This copper shielding not only reduces EMI/RFI noise, it also simplifies grounding. If you go this route, be sure to use copper shielding tape with conductive adhesive so you don't need to solder the seams. Just be sure you overlap the copper strips so they make contact. The shielding tape wraps over the recessed cover mounting lip of the control cavity so it contacts the shielding on the back of the cavity cover (at top of photo). Because the controls and components are grounded by the cooper shielding, I needed to remove the redundant ground wires I previously soldered to the components. This was necessary to avoid ground loops caused by multiple paths to ground. Since the jack is not grounded by the shielding tape, the ground wire between the jack and selector switch is still needed. The pickups and bridge are grounded to the shielding tape with the screw in the upper side of the cavity. The final assembly shows a fairly clean installation. There is no hum or noise and the new controls and wiring really improved the sound of my Les Paul Special. Definitely a worthwhile mod! 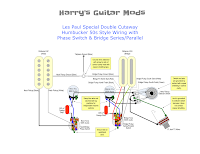 © Harry's Guitar Mods. All rights reserved. 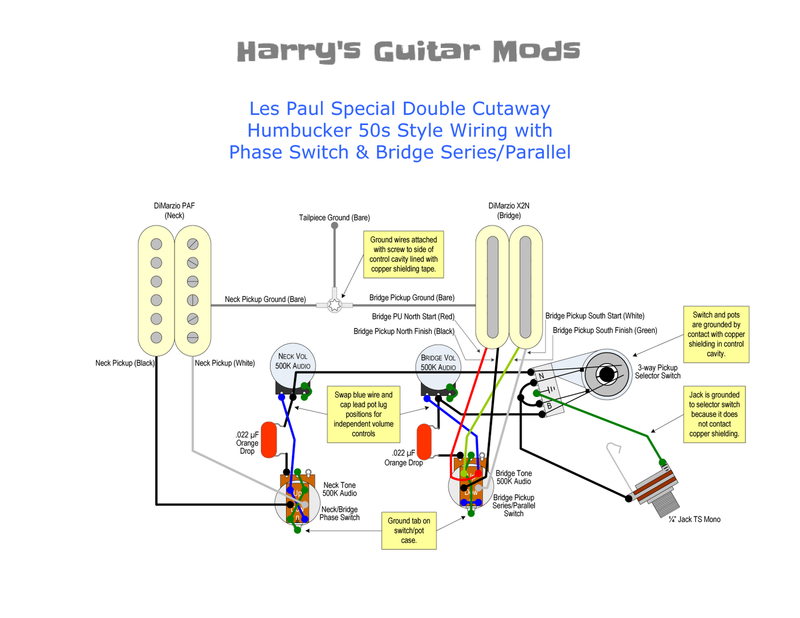 PickupBender™ is a trademark of Harry's Guitar Mods. Other trademarks belong to their respective owners.